This blog contains affiliate links that if purchased from, I will earn a small commission from. Have you noticed the price of greeting cards in the store now? They are very expensive and sometimes not very inventive. That is why I like to make my own cards. The message inside the card can be geared toward the person you are gifting it to making it a very special keepsake. 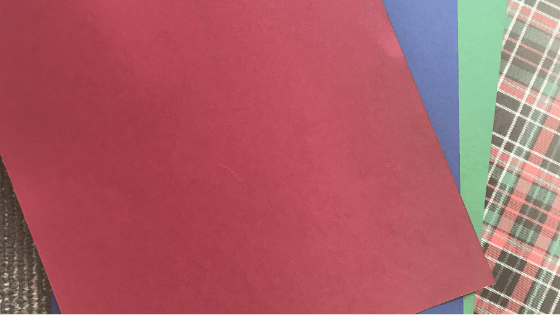 In the last blog, I showed you how to make cards on the Cricut Explore. Those cards were still unique but easy and inexpensive to make. This time I want to show you a different way to make the cards. I made three cards in an afternoon and used all the products I have around the house. As crafters we usually have a lot of items we use. In fact if you’re like me, you have more than enough paper, ribbon and embellishments. I like to take the same items and make different designs with them. As you’ll see that is what I have done with these DIY Christmas cards. 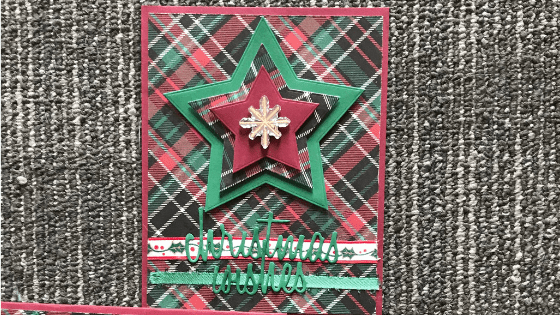 The cardstock I used was in the color red, green and a pretty plaid check design. The green and red are from the Lap Of Luxury that Core’dinations put out. It comes with 50 sheets in the colors of deep purple, dark green, navy blue, red cranberry and black. I found this at Joann’s. They have this paper on sale several times throughout the year and I usually pick up several packs of their paper. The plaid paper is a 12×12 sheet I bought from Joann’s sold individually. The bases of the cards are all done in the red cardstock. I know some crafters measure the paper but I just fold it in half and then cut it with a paper cutter. This always has worked for me. I then fold over the individual half sheet of paper over again to make the card. The plaid cardstock paper I measured to fit the card bases yet layering it so that a thin line of the red cardstock showed around the plaid cardstock. You don’t have to use perfection measuring the plaid cardstock. I just put it on top of the card base and mark it with a pencil where to cut it. Then I cut it with the paper cutter. 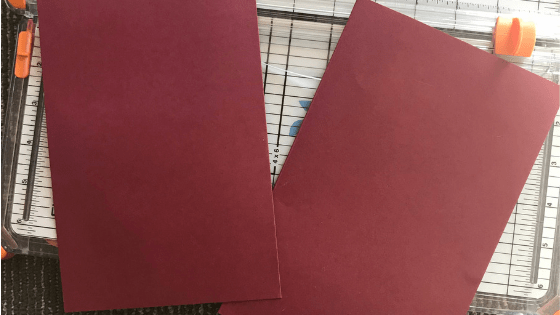 I taped the cut plaid cardstock on to the red cardstock base using Tombow Adhesive tape. I find this type of tape is the best. Nested brand sell lots of different packs of dies that come in a lot of different shapes. Plus the packs will come with several sizes of that shape. The star die pack had five different sizes in it. I used the smallest three with the smallest the size of 2X2 and used my Cuttlebug to cut them out. 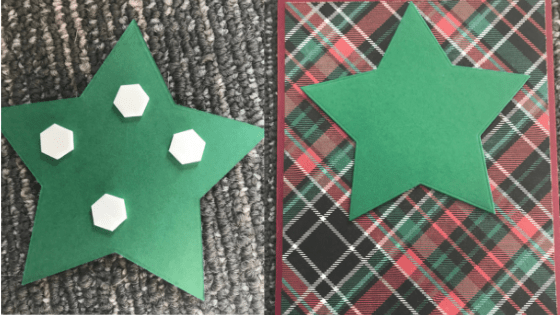 For this first card, I cutout the largest star using the green paper, the medium star using the plaid paper and the smallest star in the red paper. I used double sided adhesive foam dots on the back of the stars to attach them. The green star is placed in the middle top of the card. 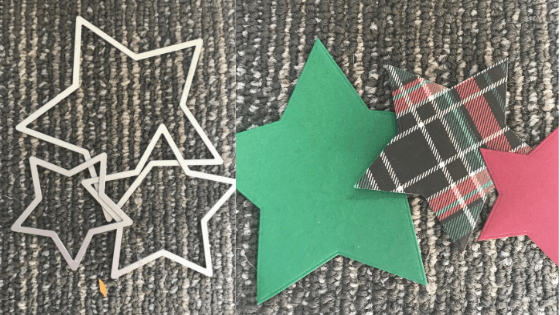 The plaid star was attached ontop of the green star, and the red on top of the plaid star. Ribbon is such a great accent to use. For all three cards I picked a green satin ribbon and a white ribbon decorated with green holly leaves. The holly leave ribbon is 3/8 wide while the green is 3/16 wide. I used my Tombow tape to glue them on to the bottom of the card. 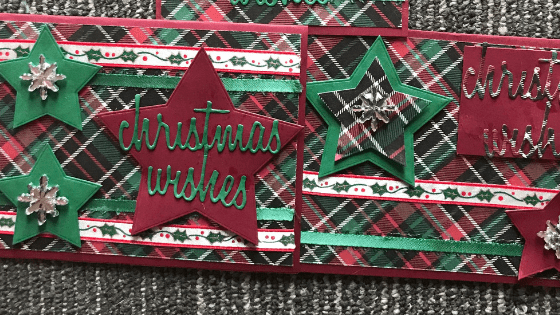 The die for the words Christmas Wishes came from Sizzix – Tim Holtz – Alterations Collection – Thinlits Die – Script Holiday Words. They were cut using my Cuttlebug in the green cardstock. Glue was carefully applied to the back of the words and glued on top of the ribbons. The next card I decided to use the holly leaves ribbon on top and then again on the bottom. The green ribbon was placed below the holly leaf ribbon on top and above the holly leaf ribbon on the bottom of the card. 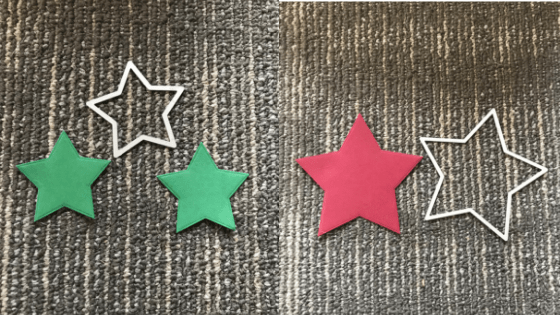 This time I cut out two green stars in the smallest size and a red star in the largest size of the dies. I placed the a green star on each of the lines of ribbon to the left and the large star to the right centered in between the ribbons. The words Christmas Wishes were glued on the large red star. I had some snowflake embellishments that I put on top of the green stars. This card I used the green paper for the medium star and placed it in the upper left hand corner. With my Cuttlebug I cut out a small star in the plaid paper and a small star in the red paper. 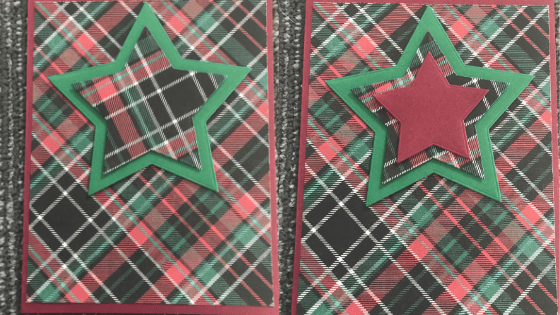 The plaid star was glued on top of the green star, while the red star was glued to the right lower corner of the card. 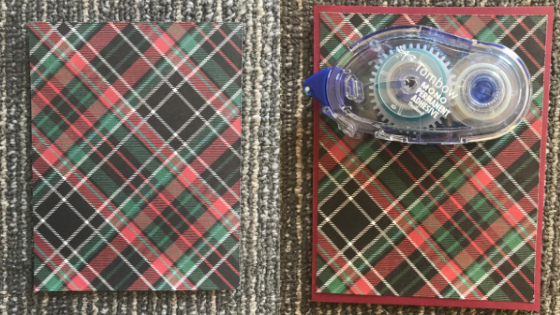 I cut out a small square in the red paper and then used my Cuttlebug to cut out the words Christmas Wishes in the plaid paper. I glued the words on to the red square. I put the square with the words in the upper right hand corner. But it needed more so I carefully removed the red star and glued the holly leaf and green ribbon on the bottom of the card. I then put the red star on top of the ribbons. Again I put the snowflakes on top of the stars. And here are the three cards I made in an hour using the same cardstock, die, words, ribbons and embellishments , yet in three different designs. Please include a note that you heard about them from the Scrapping for Soldiers website! Be sure to share this post with someone else who might need to be inspired with an idea to make for a Christmas card or to share the address for the troops.